Everybody loves it! 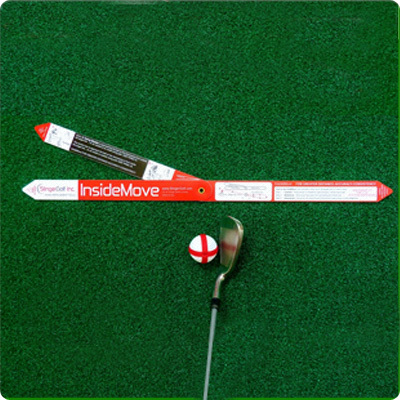 It’s a training aid that can be used for all levels of golfers as well as a practice tool. And that is my highest endorsement for a training aid practice tool – is that it can be used by everybody & I think the slinger definitely hits that market. The Slinger product is one of the top training aids, if not THE BEST I’ve seen in my entire career. There’s a lot of training aids out there, but none of them give you instant ball flight or starting direction feedback! The slinger is very useful to keep your swing in the “groove”. You’ll be able to hit a draw. The slinger allows you to feel where the release point is, while at the same time showing you the flight of your ball. My students use the slinger to teach them proper release of the golf club. The Slinger is hands down one of the greatest aids ever created. It gives you feedback that 100% tells you what is happening in your swing. Good or bad. From there it is very simple to get making the proper move in order to get the result that you are looking for … great ball striking … PERIOD! These are some of the wonderful things things our customers are saying about The Slinger. Please send in your comments and tell us how you use the Singer to improve your golf game! I wrote you earlier in the year with a review of the Slinger club that I had bought from you last December and you ended up using it as a testimonial on your website. I just wanted to follow up since you likely don’t get a lot of feedback from customers and probably appreciate when you do. I am still using the training club religiously (literally 15-30 minutes every single day while watching TV in the evenings) and it has helped me reduce my handicap from a 7.3 in February to a 2.0 now (next update should be a 1.8). With work, 3 kids and being back in college, my practice time is extremely limited and the bulk of my practice involves using the Slinger at home. Sure, it has it help me dial in my swing plane, release and things like that, but more importantly, it has taught me more about my swing than 20 years of lessons and beating balls ever did. I know now how the takeaway should work. I know how I should set the club. I know now how to get into a proper delivery position. I know now how to release the club. I know these things because the Slinger forced me to learn them. I played some good golf in the past, but I really didn’t know those things before. My swing either worked or it didn’t and if it was broke, I couldn’t fix it. This training aid has given me a methodology and a central focus point for my swing that is worth its weight in gold. On the course or at the range, I don’t think about tips or waiver in my thought process. I only think about the motions needed to keep the ball in the little cup on the backswing and then executing a proper release. That’s it. The training aid has simplified the swing for me and has completely freed me up. This February, I joined the Golf Week Amateur Tour and was shooting in the upper 80s with a few 90s sprinkled in. By the end of the year, I won two golf tournaments and moved up to the “A flight” with the good guys. From July to October, I had 19 straight rounds in the 70s with two rounds under par. The streak was finally broken a few weeks ago when I shot an 80 in a rain storm. Needless to say, I am playing some of the best golf of my life. I can’t thank you enough for making this product. Here’s my handicap revisions since I bought your product. Pretty cool! My backs not killing me any more. physically i feel better and i’m driving the ball a lot further than i have ever hit it before. I’m a novice golfer, the Slinger is the best device that I’ve found to teach how to release the club. By slinging the Slinger at a target in my home I learned how to release the club naturally. Now when I go to the range I begin by swinging an 8 iron with easy half swings, waist high to waist high toe up to toe up as though I were swinging the Slinger. This little drill has helped with my consistency and tempo and I’m amazed at the improved ball flight I’m getting by using the release I learned from the Slinger. The Slinger has helped my game tremendously. It’s the perfect tool to get your game back on track. I think you have truly come up with a great product. This is the only aid or drill that has allowed me to feel and see the result of a proper release. Thanks again! I think the Slinger is a terrific swing training device. I particularly like the fact that you get visual feedback with every swing. This is extremely helpful when working on various swing fundamentals. The Slinger has improved my swing tempo and club face positioning for more consistent ball striking.